A whale shark is a filter-feeding carpet shark and the largest extant fish species. Whale sharks are the ocean's largest fish and the sole members of the prehistoric Rhincodontidae family. Scientists believe the whale shark species originated some 60 million years ago. These large fish are often considered, by those who study them, to be the ocean's friendly giant due to their peaceful nature and diet of microscopic plankton and small ocean nekton. Whale sharks inhabit the open waters in the world's tropical oceans and are rarely found in waters with temperatures below 21 °C (70 °F). Whale sharks are classified as an endangered species. Is a whale shark a shark? Whale sharks are considered sharks. They are the ocean's largest known sharks. While the name "whale shark," might be a bit confusing, whale sharks are in fact sharks, not whales. Whale sharks bear many of the defining characteristics of sharks, including a cartilaginous skeleton, five to seven gill slits on the sides of the head, and pectoral fins that are not fused to the head. How big is a whale shark? How long is a whale shark? The average length of a whale shark is roughly 10 meters (32.8 feet). Whale sharks are the longest non-mammalian vertebrae. While the average length of these sharks is just under 10 meters, specimens have been reported to exceed that length considerably. In fact, the largest whale shark ever measured was found off the coast of Pakistan and measured 12.65 meters (41.50 feet) in length and had a girth of 7 m (23.0 ft). How much does a whale shark weigh? The average weight of a whale shark is roughly 9 tonnes (20,000 pounds). Whale sharks are the heaviest fish in the sea. Estimates put the average weight of whale sharks at just around 9 tonnes (20,000) pounds. However, several larger specimens have been recorded. The same whale shark mentioned in the section above weighed about 21.5 tonnes (47,000 lb), according to measurements by researchers. A whale shark is not a mammal; it is a fish — more specifically, a shark. Though whale sharks may behave like their gentle mammalian namesakes, they are in fact not mammals, but fish. Like other fish species, whale sharks are cold-blooded and breathe through gills that extract oxygen from water. Do whale sharks have teeth? Whale sharks do have teeth — hundreds of them, in fact — but they are tiny and used for filter feeding. Though whale sharks are indeed sharks, they differ from other sharks in several respects. Unlike many other sharks, whale sharks' mouths are located at the front of the head rather than on the underside of the head. Whale sharks are also filter feeders (like whales, but not like most sharks). The mouth of a whale shark contains 300 to 350 rows of tiny teeth and 10 filter pads which it uses to filter feed. What do whale sharks eat? Whale sharks feed on microscopic sea life called plankton and small oceanic animals called nekton. Whale sharks are the ocean's largest fish, but they feed on some of the ocean's tiniest creatures. A whale shark's diet consists exclusively of microscopic sea life called plankton and small oceanic animals called nekton. How long do whale sharks live? Whale sharks typically live 70 to 100 years. Everything about whale sharks is big — including their lifespans. Whale sharks reach sexual maturity at age 30 and can live up to age 100. Whale sharks are one of the most amazing animals in the world — and while they may be sharks, they're also one of the most gentle fish in the sea. In fact, whale sharks are so gentle, they're completely safe to swim around. 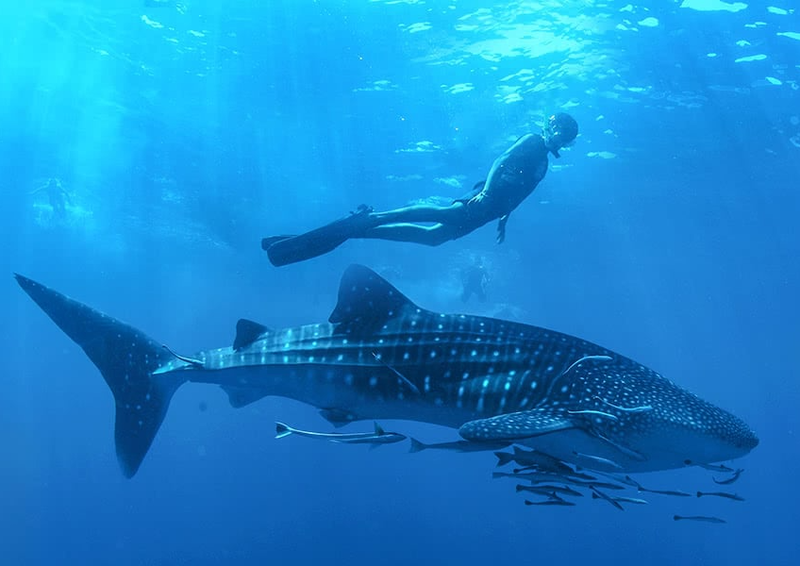 Our Whale Shark Encounter tour gives you the opportunity to do just that. Join our expert guides on a once-in-a-lifetime experience where you'll journey from La Paz, Cabo to a nearby whale shark habitat. Upon arrival, we'll give you an overview of proper diving protocol around these gentle giants. Then, we'll jump in! Experience whale sharks like never before — book your Whale Shark Encounter with our award-winning team here at Cabo Adventures today!